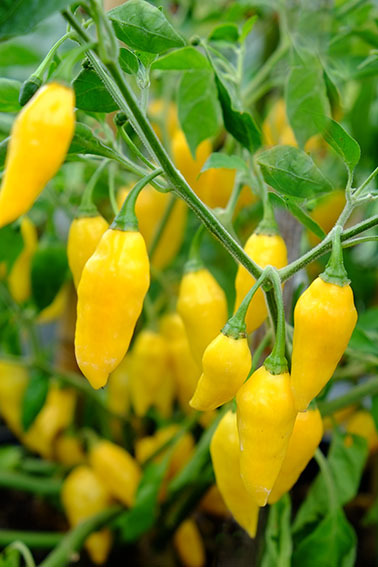 A very attractive habanero chilli that produces masses of wrinkled fruit that hang down from under the branches. The fruit, which start green and ripen to a lemon yellow, have an elongated shape with a bulge in the middle, and slightly pointed at the tip. They measure around 15 x 45mm. They are thin-fleshed (making them easy to dry), very fruity flavoured and hot. What’s not to like? 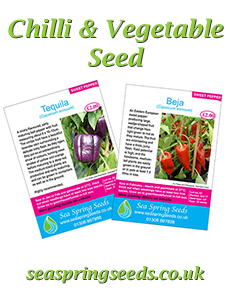 The plants are very compact and short, with an umbrella-style growth habit, and do not need staking. This is a very unusual, “stand-out and notice me” variety that is ideal as a stand alone plant in the conservatory, or is a distinctive addition to anyone’s chilli plant collection. Fruit are teardrop shaped, measuring 1.2 x 2.0cm; they start lime green and ripen to a golden yellow. When ripe the fruit are fruity flavoured. Tidy, bushy plants. Do very well in large pots, but also perform well in pots as small as 1-2 litres.